An order of fifty wings comes with a bottle of Champagne for just $1,000. Here's where to get them. When you think of hitting the town for a fancy dinner, chicken wings are probably not the first option that comes to mind. While crispy and spicy Buffalo wings and sweet and sticky barbecue wings are all finger-licking-ly delicious, it's that messy factor that usually gets in the way of an elegant dining experience. But if you're looking to class up your wing game or just have an excuse to make wings the object of your splurging tendencies, upscale lounge and sports bar The Ainsworth has you covered with its gold-covered chicken wings. The shiny wings and drummettes start by being soaked in a coconut butter, chipotle, and honey batter for 24 hours, before being fried and finished off with a dusting of gold flakes. Of course, blue cheese comes on the side so you can dip them if you so choose. The menu item is a collaboration between The Ainsworth and Jonathan Cheban, a.k.a. Foodgōd. You may recognize Cheban's name (and face) from his appearances on Keeping Up With the Kardashians. His Foodgōd website is dedicated to showcasing trendy and over-the-top treats and the accompanying Instagram account boasts over 2.6 million followers. The Ainsworth has four locations in New York City (Chelsea, Midtown, East Village, and FiDi), two locations in New Jersey (Hoboken and Newark), and a location in Kansas City, MO, with a Nashville, TN outpost set to open soon. 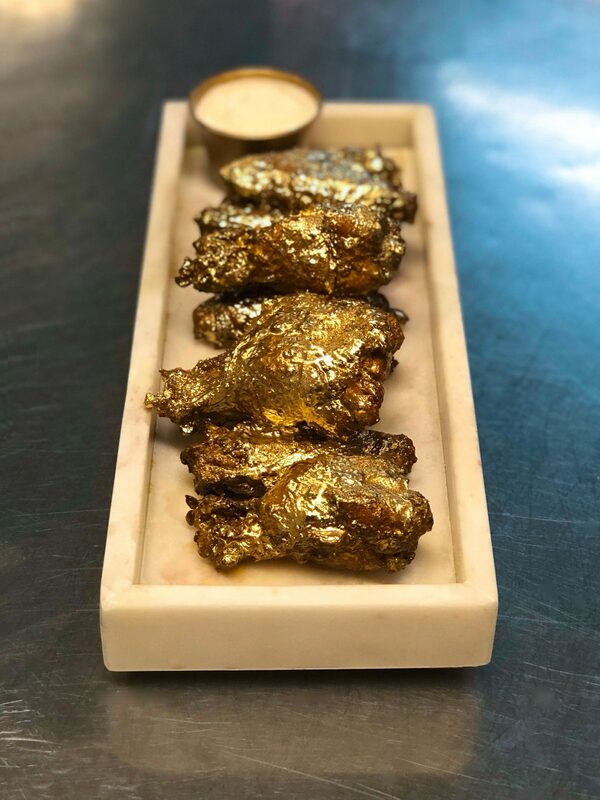 The Foodgōd 24 Karat Wings will debut as a permanent menu item at the Chelsea and East Village locations on May 1, and make their way to all of the other locations shortly thereafter. If you can't wait until May to try these decadent-looking finger foods, you can always satisfy your appetite with our recipes for gold-colored honey mustard wings, spicy sriracha wings, and maple bacon wings until then.